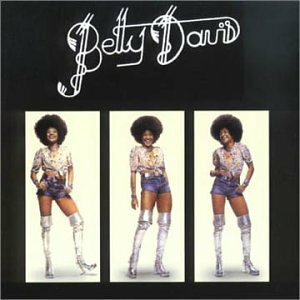 " Betty Davis' debut was an outstanding funk record, driven by her aggressive, no-nonsense songs and a set of howling performances from a crack band. Listeners wouldn't know it from the song's title, but for the opener, "If I'm in Luck I Might Get Picked Up," Davis certainly doesn't play the wallflower; she's a woman on the prowl, positively luring the men in and, best of all, explaining exactly how she does it: "I said I'm wigglin' my fanny, I'm raunchy dancing, I'm-a-doing it doing it/This is my night out." "Game Is My Middle Name" begins at a midtempo lope, but really breaks through on the chorus, with the Pointer Sisters and Sylvester backing up each of her assertions. As overwhelming as Davis' performances are, it's as much the backing group as Davis herself that makes her material so powerful (and believable). Reams of underground cred allowed her to recruit one of the tightest rhythm sections ever heard on record (bassist Larry Graham and drummer Greg Errico, both veterans of Sly & the Family Stone), plus fellow San Francisco luminaries like master keyboardist Merl Saunders and guitarists Neal Schon orDouglas Rodriguez (both associated with Santana at the time). Graham's popping bass and the raw, flamboyant, hooky guitar lines of Schon or Rodriguez make the perfect accompaniment to these songs;Graham's slinky bass is the instrumental equivalent of Davis' vocal gymnastics, and Rodriguez makes his guitar scream during "Your Man My Man." It's hard to tell whether the musicians are pushing so hard because of Davis' performances or if they're egging each other on, but it's an unnecessary question. Everything about Betty Davis' self-titled debut album speaks to Davis the lean-and-mean sexual predator, from songs to performance to backing, and so much the better for it. All of which should've been expected from the woman who was too wild for Miles Davis." is there a way to d/l the whole album? or do you have to do one track at a time on divshare?